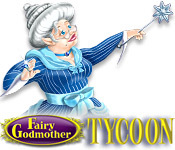 Fairy Godmother Tycoon is rated 4.7 out of 5 by 83. Rated 5 out of 5 by Discordia33 from Unlike any other I've been getting games from BF for 11 years. This is one of the very small handful of games that is unlike any other I have played. It's fun, challenging and has a cute story. I've beaten it many times and still come back for more! Rated 5 out of 5 by scorceres from Very fun game The story line is fun. This is a must play game. One of my favorite game. Looking forward to seeing a second version. Rated 5 out of 5 by JakesMum from Outstanding game - wish it came for a Mac! I bought this game years ago when I had a PC - it was fun for the kids, and even fun for me! I now have a Mac, and was bored - still had the log in info and was hoping that this game was designed to work on a Mac too. I was really sad it wouldn't work. It really never gets boring, because one small change, and the outcome is different! One of the best games I have seen! Rated 5 out of 5 by Doylescat from Loved this game I missed this when it came out but saw someone mention it in another review. This game is terrific fun and totally different from other TM games because there is little to do during the "play phase", you set everything up (supplies, prices, marketing etc) and then the game runs in short bursts. I didn't think I'd like it, but I actually loved it. Rated 5 out of 5 by Ickis from Cute fun little game This is one of my all time favorites. Though I have to admit I am confused as to how this could be considered a time management game. Basically you are running a potion shop. You have to buy ingredients to make potions, research new potions, set the sale price, check the forecast, advertise, research and upgrade. You have unlimited time to plan your day. Once your day starts there is not a whole lot you can do, but there are some actions available as you progress. I find it to be a fun game and a nice alternative to true time management games where you rush to try to beat a time limit. I think it is more of a strategy game - balancing buying supplies, making upgrades, advertising, research, etc. Overall it is a cute fun game. I find it has good replay value. Rated 5 out of 5 by Legypt from My all time favorite I loved this game and wish they would make a sequel. The story was hilarious, the side "choices" were great (and added replay value since I wanted to see the consequences of each option) and the game itself was challenging without being impossible. I highly highly recommend this one. Rated 5 out of 5 by kibachica from One of the best P.C games around. I absolutely love this game! The story lines, the characters and the humor are top notch! Even though it is an older game, I found it more captivating and original than any modern game! It is definitely up there with greats like the Chocolatier series, and Miss Management. 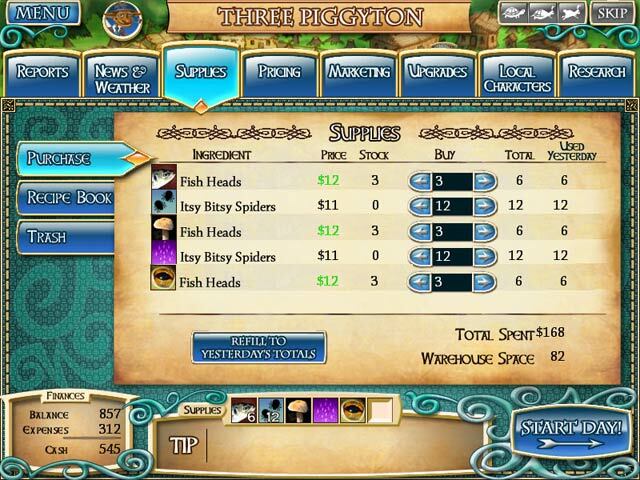 Rated 5 out of 5 by korgirl9 from One of the Best Big Fish Games I love how different this game is from other popular categories such as Time Management or Hidden Object. 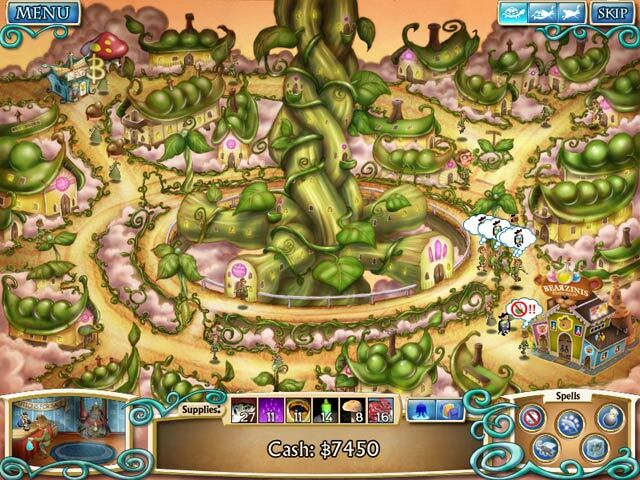 This game offers a unique set of challenges that involve helping Fairy Godmother reclaim her place at the top of the potion selling industry. You'll have to use reports and forecasts to determine what to purchase, spend your money wisely on upgrades, marketing, and supplies, and make some decisions when the dialogue requires it. Beyond that you follow an absolutely hilarious dialogue that's sure to keep you entertained. The graphics are appropriate for the style of game. The goals are challenging to achieve. It's a fun concept. What's not to love? Rated 5 out of 5 by Pianist9221 from Highly Enjoyable This game is so entertaining. I still haven't beaten the final kingdom, but I'm still so in love with this came. Entertaining, and yet you're not wildly clicking your mouse all over the place in a attempt to do everything as quickly as possible. It involves a great deal of strategy on the later levels, but that just makes the game THAT much more enjoyable. Rated 5 out of 5 by sztt from Terrific and fun strategy game Love this game! The graphics and content are very humorous. There is a lot of strategy involved in this game (ingredients, marketing, etc) and it is all really fun. A long playing game and yet once done you can play it repeatedly over time as your profits and the amount of time you take to cycle through the various scenarios will vary so each game is like new due to all the many variables. Excellent game. Highly recommend!